Investors tend to become too emotional. 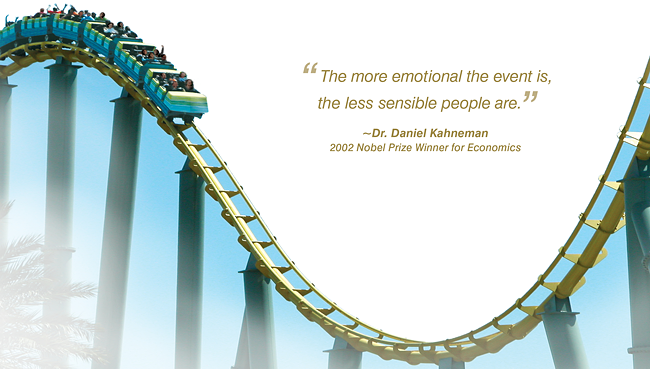 Emotions affect investments badly. Assume stock price moved down by 2% in a day. The drop of 2% might cause anxiety in investors who have disproportionate fear of losses. They might suffer from sleeplessness or simply sell the stock in the same day regardless of their intended portfolio time horizon. Behavioural finance involves considering investors’ long-term preferences for risk and return. Investors may be affected by emotional responses and behavioural distortions. Someone who is highly risk averse can consider forgoing a bit percentage of market returns to buy insurance. For example, he can own a portfolio of 60% bonds and 40% equities just to make sure his portfolio is not as volatile as others who could be holding onto 70% equities. Of course, the investor who holds lesser equities will quite likely have lesser portfolio value in the long term (20 to 30 years). The industry’s traditional approach has essentially been to deliver “optimal” portfolios which are built on taking for granted that the investor will be constantly and totally rational. This approach imposes a huge emotional and practical obstacle on investors. They are required to tolerate the ups and downs of the investing cycle and see through the longer term horizon. Some investors simply cannot put up with that. This can lead to poor decision making and lower performance. When investors strive for rational perfection in their portfolios, they become more likely to make emotionally driven decisions. They may pay too much attention to the short term, forgetting the longer term horizon. Investors may invest in “familiar” assets, firms in their region. They feel safer holding shares of companies that they are familiar with and believe they can manage these risks better. They may buy when everything is bullish. Emotionally, they feel comfortable following the herd. They may also sell when everyone is bearish, in times of extreme fear. Some risk adverse investors may hold their money in cash, incurring high opportunity costs. On average, all these behaviours drag down our long-term returns. By simply taking less risk you can buy easily and naturally emotional insurance, but at what cost? However this also reduces long-term returns, often in a dramatic way. When they get to choose many will prefer not to invest at all, rather than investing on a mathematically perfect portfolio, just because the first choice makes them feel more comfortable. They leave their wealth sitting in cash. An investor with large amounts of wealth in cash is, in fact, purchasing emotional comfort at a very high premium. By not investing, a moderate-risk investor in a globally diversified portfolio is missing out on long-term annualised returns above what you’d get from holding cash (averaged over many years) of about 4–5% per year—a huge amount to forgo because investing feels too uncomfortable! Unlike the traditional industry, I don’t believe this purchase of emotional comfort is irrational. Emotional comfort is important and necessary, but it’s very expensive. Although there are occasions of people who may need more emotional comfort compared to others, what is clear is that no one has to pay 5% of their wealth every year to get a little rest. 1. Passive funds are a better choice than active funds, since more than 84% of U.S. active funds underperformed the S&P 500 over the year. From a long-term view, over the past ten years, more than 98% of active funds failed to beat their benchmarks. 2. Investing like an idiot, but earning like a Pro. Investing in low fees index funds is the only way to retire in peace. After years of research it has been reported that low fees are "the most proven predictor of future fund returns". In other words, the cheaper the costs, the better the fund is likely to perform and the more money you're likely to make. 3. Stop getting cheated - Trading Courses. Passively managed funds have the lowest costs and now, the highest returns over time.